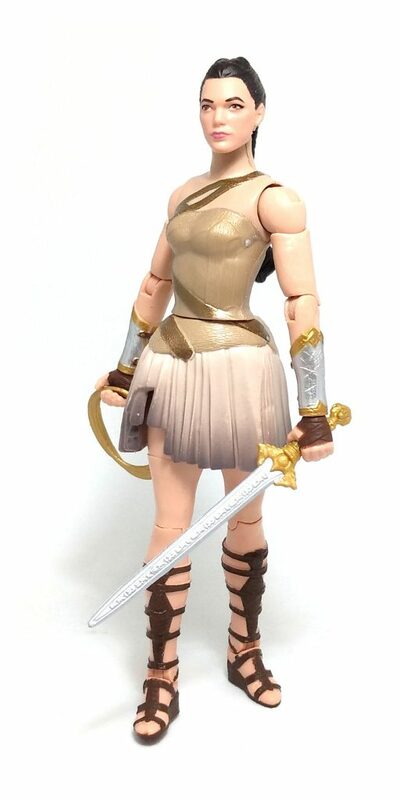 After reviewing both Queen Hyppolita and the cloaked version of Wonder Woman, I was actually expecting this version of Diana to be the super-posable character in the series, considering she is depicted here wearing what I assume is Amazonian casual clothes. 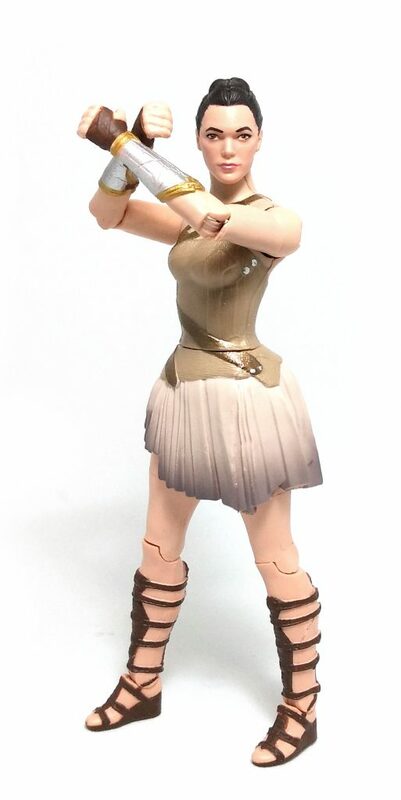 Princess Diana sports the short tunic/dress she wears during the training sequence on her home island, which results in a deceptively simple sculpt. There are subtle textures on her bodice, and the drapery on her skirt seems to follow a very natural flow, but the real strength of this figure is capturing the overall body proportions in such a way that looks powerful yet feminine. Once again the head sculpt is excellent. The face is the same used for the Wonder Woman w/cloak version, but this time around her hairdo is a long, thick, luscious braid. 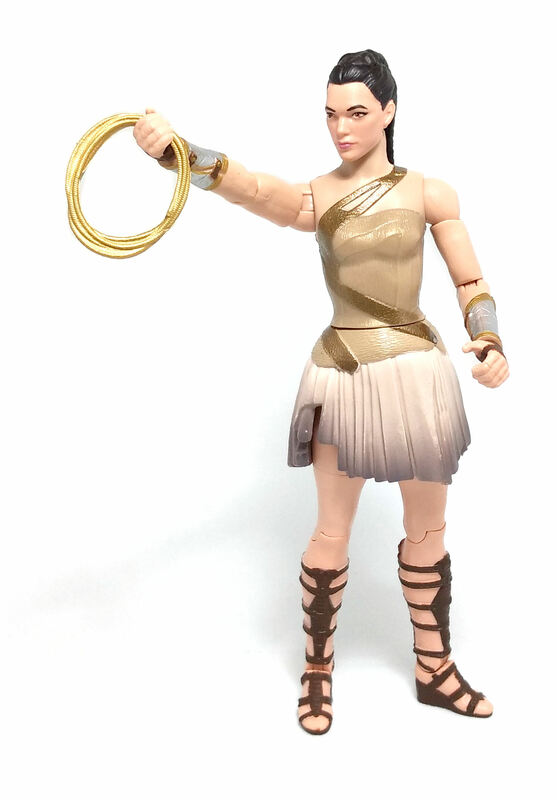 So far, this is the only Wonder Woman figure in this series that can actually cross her arms before her, which is a good thing, although the short skirt piece still hinders somewhat the range of movement at the hips. Overall, articulation is decent but not quite as I had expected. The paint applications on this figure are neatly applied but have definite highs and lows. There are silver and gold details on the bracelets and the skin tone on the torso is close enough to the color of the plastic. On the not so great side of things, a gray gradient was applied on the edge of the skirt but the paint rubs off the raised edges both at the front and the back because of the way it was packaged. 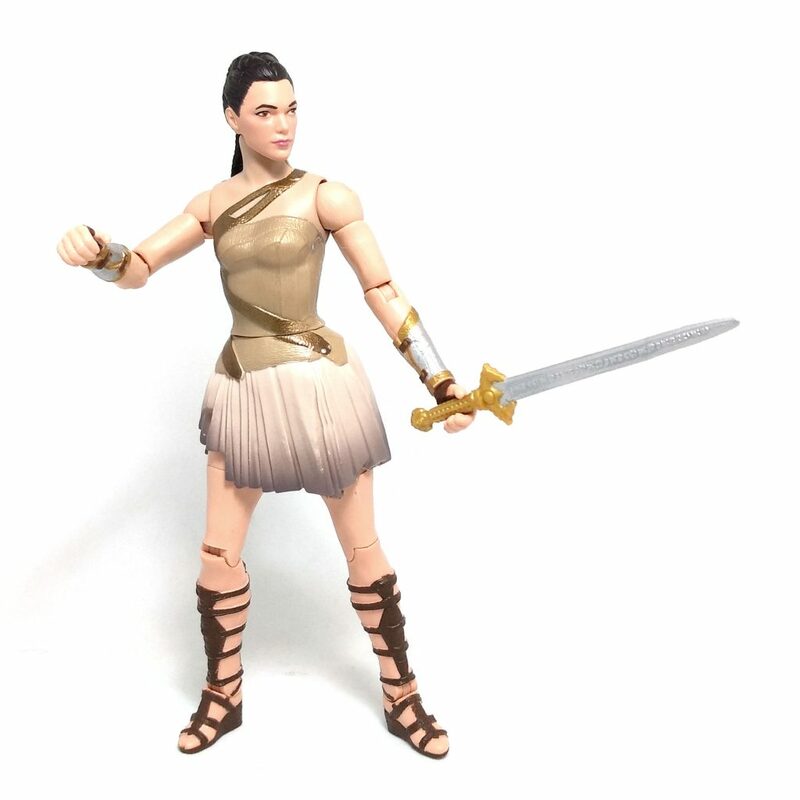 Another issue is the feet missing a paint application to convey the fact that Diana is actually not wearing sandals while using this costume, but some sort of reinforced slippers. Believe me, I found online pictures backing this up. On a brighter note, the paint apps on Diana’s face make her look gorgeous. Not quite to the point of having a tiny Gal Gadot in hand, but the paint operations really bring out the best of the sculpted portrait. 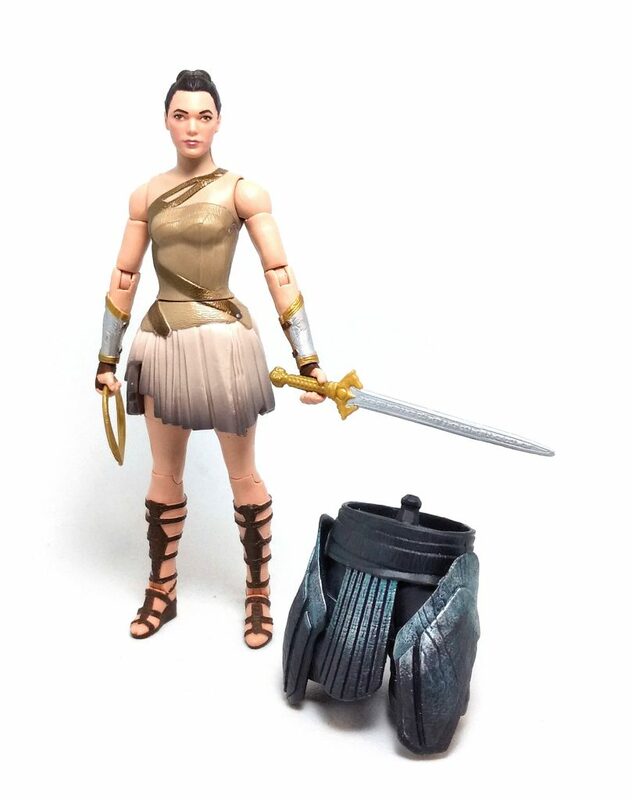 As far as accessories, Diana comes armed with a soft rubber lasso rolled up and a different Not-The-Godslayer sword. Both accessories are very detailed and were molded in gold-colored plastic with only the sword blade painted bright silver. This time around, the included Collect & Connect piece is Ares’ hips and upper legs section. 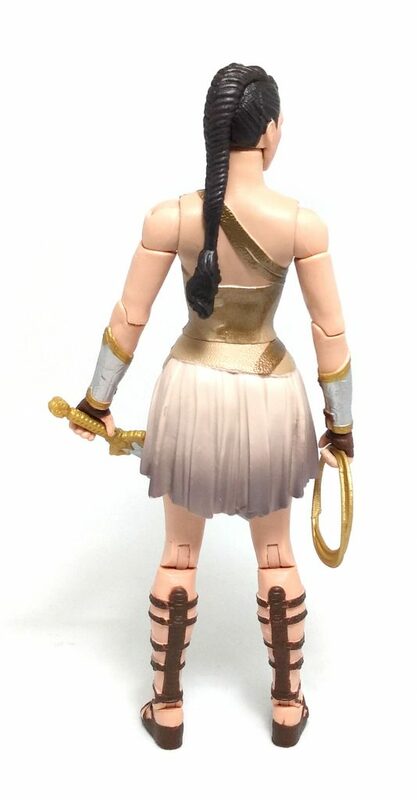 ASa stand alone action figure, this is not an identifiable Wonder Woman look for Diana, but despite the small paint issues, I have to say that this is my favorite figure from this series so far.